Climate change induced disasters and risks (CCIDRs) are major challenges to development and live of people in Africa. Especially, farmers and pastorals (FAPAs) who are pillars of African economy and livelihood are worst affected segments of society by CCIDRs. With increasing intensity and frequency of such disasters, it will be difficult for humanitarian agencies, NGOs etc. to provide sufficient and timely relief and rehabilitation assistances to FAPAs in future. Thus, developing supplementary strategies to existing humanitarian assistance efforts are important. Establishing CRI scheme for FAPAs through which they can buy insurance policies to protect themselves from CCDRIs and/or for post disaster rehabilitation is one such strategy of meeting challenge. But, traditional insurance systems can’t be applicable to FAPAs due to many reasons. Thus, it is vital to design alternative insurance models which are simple and acceptable by FAPAs. I hereby propose two CRI schemes to insure FAPAs. 1. Government-FAPA partnership CRI scheme: The current annual tax rate being paid by FAPAs will be increased by 10% meant for CRI and government (GOV) on its part shall waive 20% of this tax as a contribution to CRI. 2. In-kind premium payment scheme: Farmers shall contribute some amount of grains at harvest with values that corresponds with fixed amount of money say for example US$75-100/HH/yr (negotiable) to pay for CRI through unions. Similarly, pastorals will contribute milk with same money value to buy insurance premiums. For implementation, I propose hybrid of Meso and Macro level in which FAPAs will be ensured as Unions/groups (risk aggregators) but GOV will act on behalf of FAPAs to buy and hold insurance policies, appeal for payment etc. Advantages of these schemes include: save time and money, easy to convince FAPAs to accept proposed schemes. These schemes shall be started as pilot project in representative farming and pastoral areas of Ethiopia. Details are presented herein. Farmers and pastorals (FAPAs) account for largest proportion of African population and they are play pivotal role in the economy and livelihood in the continent. But, they are the most vulnerable and worst affected segments of the society by climate change induced disasters and risks (CCIDRs) such as drought, flood, sea level rise etc. CCIDRs are seen to be increased in frequencies and intensities in the future with more and more grave consequences in Africa. With such scenario, it will be difficult to GOS, humanitarian agencies etc. to provide sufficient and timely protection to FAPAs from anticipated CCIDRs or post disaster relief and rehabilitation assistance due to several reasons. Thus, developing supplementary mechanism of providing adequate protections from climate induced risks to FAPAs and/or provisions of sufficient and timely post disaster relief and rehabilitation assistance is crucial. It means that US$2.5 will be paid by a FAPA as contribution to CRI and US$5.5 will be paid by the GOV as contribution to CRI. The total sum of money that will be paid to CRI client insurance company = 2.5 + 5.5 = 8.0 USD/year/Farmers/pastorals. Based on this new arrangement FAPA will pay a total sum of US$27.5 as annual tax/year. GOV will receive 27.5-5.5 = US$19.5. I propose the insurance payment based on this model to be done yearly for at least 5 yrs. This being, mechanism for collecting money from individual FAPA, insurance policies shall be bought as group insurance. Meaning that FAPAs in specific location will be identified and organized into CRI group whereby individuals in the group will pay money based on the above model and then the total sum of money paid by all people within the group (farmers’ unions and pastoral groups) shall be transferred to client climate risk insurance company such as African risk capacity (ARC) where it shall ensure the group as single customer. 2.1 Farmers: Grain crop producing farmers in Ethiopia can contribute some amount of grains at harvest with values that match with fixed amount of money say for example US$75-100 (negotiable) through farmers unions. At this juncture, farmers in Ethiopia are already organized into unions through which they receive several services. Thus individual farmer will contribute grains equivalent to USD$75-100/house hold (HH)/yr to their respective unions and then unions will aggregate and sell grains. Then the collected money from sell of aggregated grains shall be used to buy insurance premiums through GOV. Each union will be insured as a single insurance holder (union). Each member of the union shall receive insurance certificate as member of aggregate insured union so that it will use it as guarantee to access credit and share insurance payouts. 2.2 Pastorals: Pastorals will contribute milk daily or any time of the year until its total money value reaches for example to US$ 75-100/HH/yr. To implement this model, pastorals should be organized into CRI groups to collect milk from member HHs and sell it to merchants. It will also be important to involve private firms for purchasing, processing and selling of collected milk. Bundling or linking the above CRI schemes/models with access to credits will encourage FAPAs to accept the models. For implementation of this CRI scheme, I propose a hybrid of Meso and Macro levels insurance system whereby insurance policy holder will be GOV on behalf of FAPAs unions/groups (risk aggregators). But payouts will be made directly to risk aggregators (FAPAs groups) when applicable in which individual FAPAs will receive services through their unions and groups based on established criteria. Satellite based weather index insurance system employed by ARC which entails risk transfer against crop and feed losses due to rainfall deficit etc. 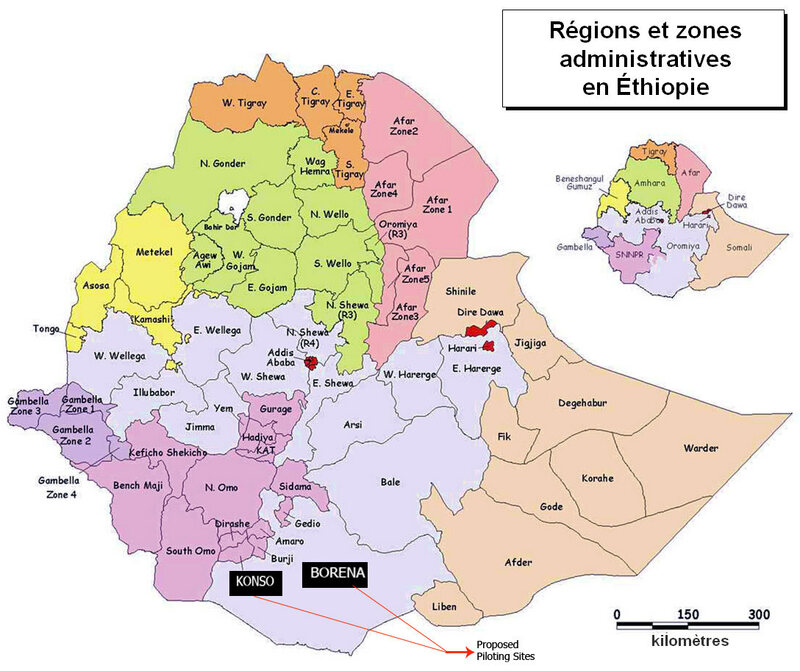 The first crucial step to pilot these CRI schemes are to lobby and convince government of Ethiopia to accept the CRI schemes and create enabling environment for its implementation. It is also important to convince the government to be enrolled as a member of Africa risk capacity (ARC): Sovereign disaster risk solution, a specialized agency of the African union. It has 30 Africa member countries so far. This will be achieved through the involvement of UN Climate Resilience Initiative A2R and InsuResilience Global Partnership. Experts of UN-A2R and InsuResilience global partnership present and elaborate GOV about the importance of CRI systems; convince it to accept the proposed CRI schemes and be a member of ARC. The next step is to establish project WG having the right mixes of professions drawn from relevant stakeholder organizations. WG shall be established under the auspices of Oxfam-America regional office in Addis Ababa (AA) where the owner of the project shall be hosted and coordinate the project. I also propose the project money to be transferred to and administered by Oxfam America, AA office. The existing annual taxing systems being employed to collect taxes from FAPAs in Ethiopia should be studied and documented. The study should come up with information such as how annual tax rates are levied on individual farmers and pastorals, methods of tax collections, tax policies and regulation etc. This information will be used as inputs in developing Model-1 CRI scheme. Regulations modalities and guidelines for establishing and administration of pastoral CRI groups need to be prepared by professional WG stated above and approved by relevant government bodies. This one of the CRI models preferably Model-2 is envisaged to be piloted in Konso farming and Borenal pastoral areas, Southern Ethiopia which experiences adverse effects of climate change impacts. In each of the piloting area, specific village with FAPA population of 5000-10000 people shall be selected by setting selection criteria. This will be done in collaboration with political administration staffs of the piloting sites. After selecting the piloting villages in each faming and pastoral areas, the next task will be to create awareness, sensitize, lobby and convince to accept the CRI model. Union and clan leaders of pastorals shall be used as entry point to start the action. Participatory discussions about the CRI models, its importance etc will be made by various employing combinations of social science tools and approaches. After convincing union and clan leaders, HH will be called for meeting and discussion will be made about the CRI model using similar social science approaches and tools so that they will accept the insurance scheme. WG should first prepare social study approaches and tools such as PRA methods, semi structured questionnaires etc. and test them for validity. Details of the methods will be developed later. After the proposed CRI scheme has been accepted by FAPAs, the next task will be to organize them into CRI groups. The CRI group shall have its identification details, number of members, group name, and code etc. The group and individuals within the group shall be registered, shall have legal documents, membership ID, Insurance certificates etc. The existing insurance procedures being used in other sectors shall be adopted with required modifications. As a rule of law, women HH shall constitute a minimum of 40 % women HH of total number of FAPAs covered by insurance. Famers unions are administered by approved regulation, law and anti-corruption measures which ensure equitable share of any common benefit including insurance payouts. The same measures shall apply for pastorals. The project piloting pastoral areas and exact implementation villages of each piloting area will be clearly marked, Geo-referenced and digital maps will be developed. African risk capacities (ARC) which enables African governments to insure themselves against natural disasters and responds swiftly in events that citizens are face such catastrophes. Thus, Ethiopia shall be enrolled as member of ARC after lobbying it’s for membership. Thus, the CRI money collected from FAPAs based on either of the two models will be transferred to ARC to buy insurance policies. The next action will be to collect CRI money from FAPAs and buy insurance policies from client Company (ARC). This will be done as follows: For Model-1, the all details of CRI ensured FAPAs will be shared to ministry of finance. Then, after FAPAs paid their annual taxes, ministry will calculate total amount of CRI money and transfer it to ARC using software developed based on mathematical model developed for model- For model-2, Unions and pastoral groups will collect the money from members and pay insurance company. Insured project territories shall be monitored for weather variables for predicting weather induced disasters are likely to occur. The information will be used to make decision whether the disasters are likely to happen or already happened are beyond the thresholds or not. If it occurs above thresholds, immediately request will be made to Client Company for payments. D-base and progress as well as success of the pilot CRI project shall be shared online. This will be achieved by creating online portal on our web site: www.academic-support-africa.com. Some of the key actors and along with their roles in the implementation of envisaged pilot project proposal are indicated below. Provide information on existing climate risk insurance companies globally. It will agree to integrate the proposed CRI scheme into its existing relevant sector institutions and ministries. It will agree to waive 20 % of annual tax being paid individual pastorals as a contribution to CRI scheme. Act on the behalf of Pastoral CRI groups with all stakeholders including insurance companies enter agreement, hold insurance policies etc. It will play the overall leadership role in implementing of this insurance scheme. Monitor the insured areas for weather and climate variable. When the weather index exceeds threshold, calculate the losses such as crop yield loss and effect insurance payouts. Shall share its experience, knowledge, lessons etc on climate risk insurance systems. I propose that either or both of the CRI models to be piloted in Konso farming and Borena pastoral area, Southern Ethiopia which are adjacent to each other (Fig. 1). At the same time these areas are affected by climate change impacts. The people of Konso farming areas well aware of weather and climate change induced risks and disaster management and they have indigenous knowledge and skills of disaster and risk managements. For example, if the perceive they next cropping season is likely to be affected by shortage of rain, they traditionally store grains/seeds to overcome such challenge. Thus, if they are introduced with insurance models especially model-2 in this proposal, It is likely that they will most well-come the offer. Similarly, pastorals of Borena area have the tradition of storing milk unspoiled for long periods of time. This is one of the adaption mechanisms to drought. Thus, if they are offered opportunity to insurance scheme, there won’t be reason that they don’t accept it. But, obviously, a lot of awareness creation sensitization, training works etc. are mandatory before FAPAs accept the CRI schemes. Lessons, experiences and challenges will be documented analyzed synthesized and will be exploited for scale up and out of CRI scheme to wider areas in the country and elsewhere in the world. It will be far easier to convince FAPAs to be embraced by these RCI schemes than doing same by conventional ways Insurance system. Th models will enable to collect sufficient money from FAPAs to buy insurance policies which otherwise impossible for individuals to do same. The proposed CRI schemes/models especially the second model will make FAPAs self reliant and confident as they will be insured by their own money (without donor assistance). This will make the models sustainable. The models especially the second model will easily be scaled up and out.. There will be fast response from client insurance company in the events of anticipated or aftermaths of disasters. This scheme will help to decrease/avoid losses of assets, lives and livelihoods of pastorals that could happen due to climate induced disasters, shocks etc. The budge lines estimated for different items are summarized in Table 1. The budget lines shown in Table 1 are in crude forms. Detailed description of the budget will be prepared later. Please note that the estimated budget lines shown in Table 1 below are budge for estimated to implement only one of the CRI models indicated above preferably to implement Model-2. Table 1. 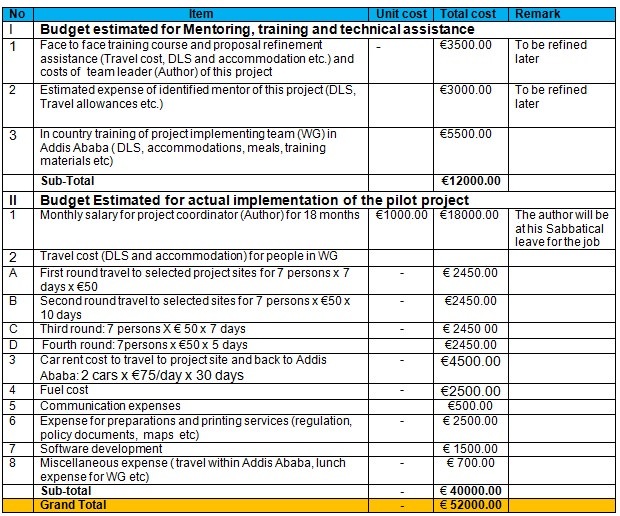 The budget estimated for training and actual launching of this pilot project. Key actions envisaged to be accomplished during piloting of one of the CRI models along with the required duration (Months) are summarized in Table 2. Detailed action plan of the envisaged pilot project will be done later. Table 2. Summary of timeline of major project actions to be accomplished during piloting phase. African Risk Capacity (ARC). www.gove.uk/government/uploads/system. Accessed on 09/05/2018 at 7.09 pm. Oxfam-America (2010). Horn of Africa risk transfer for adaptation. HIRITA project report: November 2007—December 2009, Oxfam America, Boston.